For one, it’s a look of joy and relief—and as much happiness as he can muster. For the other, it’s an angry look of despair; sadness beyond tears and a wondering of what could have been. It was truly a match that “no one deserved to lose,” no matter how much I despise that cliché. For something this special I can make an exception. Just one more time for emphasis: THEY PLAYED TENNIS FOR 11 HOURS AND FIVE MINUTES before a winner was crowned. From a purely athletic point of view, it would have been much more impressive if the match was 11 continuous hours, starting at maybe 10 in the morning and ending at 9 at night. But from tennis’ point of view, it worked out perfectly for them. A match spread over three days (three days!!) boosted the publicity ten-fold. People haven’t paid this much attention to tennis since the Williams sisters started wearing tight clothing. 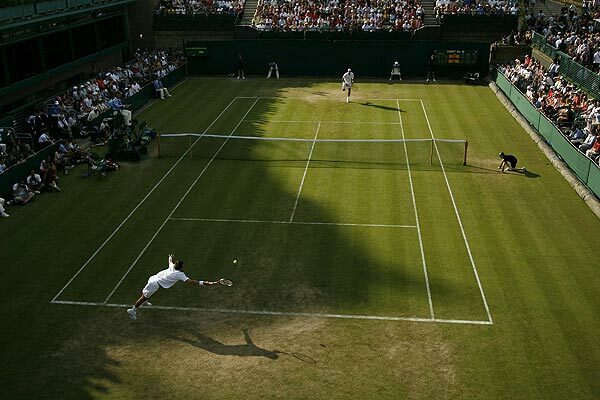 Let’s be honest, for most people, tennis on TV is one small notch above golf on the excit-o-meter. 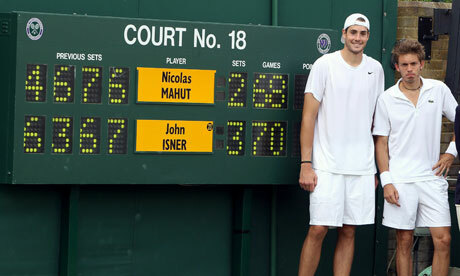 But the longer John Isner and Nicolas Mahut battled and the more attention it picked up, people across the globe tuned in by the bunches. For all the talk soccer is getting lately for making its way into pop culture, tennis scored an ace of its own with this match. Something else I find interesting is the way fans picked which guy to pull for. Some picked straight along country lines and went with Isner, the American, but others were drawn to Mahut for his resiliency and underdog quality. This guy was on the ropes for about six hours straight and never gave up. Finding the strength to stand at that point is a feat in and of itself, but the hustle, the full extension dives, and the never-say-die mentality of Mahut were hard to root against. Neither player was a big name in tennis coming into the match, but now, their names are etched into the history books with a record that won’t be broken any time soon. In a true testament to sport and superstition, I thought it was awesome that both players came back out for the remainder of the match in the same clothes they wore the day before. Eleven hours and five minutes. The world record for the marathon (26.2 miles) is Haile Gebrselassie’s 2008 time of 2 hours, 3 minutes and 59 seconds. At that pace, he could have run just under five and a half marathons during the time it took to finish that match. ESPNU showed the match over their scheduled programming yesterday. I don’t know if anyone else noticed it, but sorry lacrosse. You finally got national television and bam! Snuffed for tennis. It’ll be okay though, just play “The Ultimate Lax Bro” video a few dozen times and put your pinnie on. The hurt will fade. 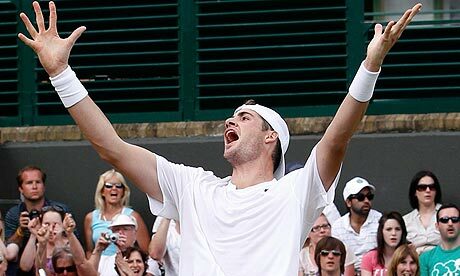 Last but not least, the final score line was 6-4, 3-6, 6-7 (7), 7-6 (3), 70-68. Wait a second, the guy is 6’9” and just put up 70? Somewhere out there, Fran MacCaffery is planning a recruiting trip for Mahut.